4 Purchase the Pomeranian Handbook by Denise Leo. A perfect Chocolate Pomeranian is a rich brown color. 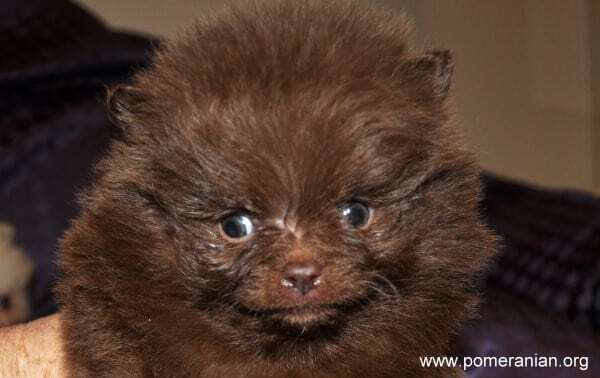 The chocolate Pomeranian is also often referred to as Brown. Both chocolate and brown are the official and correct terminology for this colored Pom. Both phrases are accurate and can be utilized. In many versions of the Pomeranian breed standard, the color chocolate is referred to as brown. This Pom dog color is one of the original Pomeranian Dog breed colors. Many important early champions in the history of the Pomeranian were chocolates. 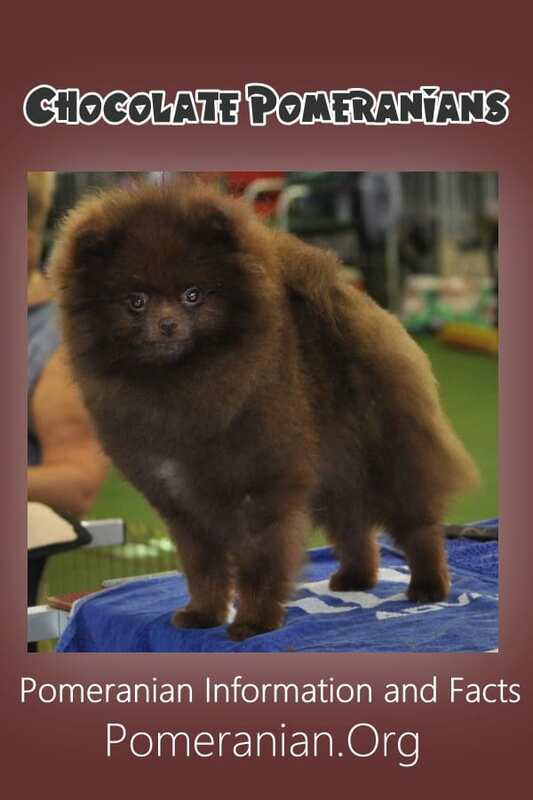 Chocolate Pomeranians are beginning to be popular in the show ring. Thus boosting it’s global acceptance and interest in this color. A regular occurrence is to now see correct, quality chocolates being shown. Not all dog show judges appreciate colored Poms. Many of these beautiful little dogs are quickly gaining Championship titles over standard colored dogs. The color brown includes many shades of chocolate color. They appear in many diverse shades of brown. From the light chocolates to the medium chocolates. Then onto the deep, dark chocolates. The light beaver, through to the darkest chocolate brown colors. Some dogs might be appear to be more reddish chocolates. Others are so dark-colored to appear nearly black. Dark chocolates will never be so dark, that it is problematical to determine their actual color. The chocolate color in the Pomeranian is rich, dark and candy-like in colour. This displays as a self-color right through his body. 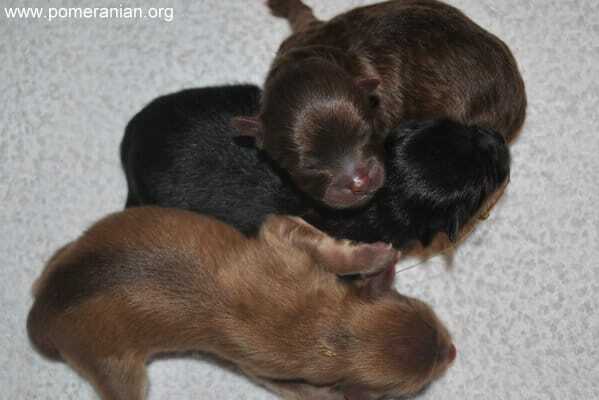 A chocolate newborn Pomeranian puppy is a solid brown. The chocolate Pomeranian puppy stays nearly the same color through out his life. The only changes being are a little fading of the coat color owing to damage from the sun. Coat color fading is additionally typical in older Pomeranians. If your dog spends time outside, his coat may have some red, or “sun burn,” on it. Chocolate owners wishing to do well in the show ring should keep their dog out of direct sunlight. There are many color enhancing dog shampoos available. 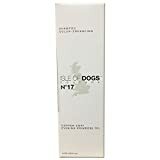 These will improve the appearance of a dog’s sunburnt brown coat. A genuine chocolate Pom dog will have a solid brown coat. The dog’s points refer to the nose, pads, rims and lips. A brown dog’s points must be a dark brown colour. In canine terminology this is referred to as being self-colored. A Pom dog with any black colouring on his points or coat ? Well he’s not a chocolate or Pomeranian brown dog. Black simply cannot occur in a brown dog, because brown and black can’t be present concurrently. Pomeranians can be found in a wide variety of color. People often feel very confused when it comes to the details of chocolate Pomeranians and Pomeranian brown dogs. Cream and beaver colors are at times mistaken, by very inexperienced owners as chocolate. Beaver is the dilute of the chocolate brown color in the Pomeranian dog breed. A further brown dilute is the incredibly beautiful and elusive Lavender Pomeranian. Lavender Pomeranians are generally the outcome of breeding a dilute beaver to another dilute such as a blue. Visit our color page for additional and detailed information on all the Pomeranian Colors. The Beaver Pomeranian, Lavender Pomeranians and the Chocolate Sable Pomeranian. Chocolate Sables are a different type of sable to the ordinary Pomeranian sable. Tipping on their guard hairs is certainly not black. As discussed previously, black just cannot exist in a brown dog. The guard hairs of the Chocolate Sable pom finish with dark chocolate tips. The base coat color of this dog is a light brown shade. Apart from solid colors, chocolate or brown also appear in the Pomeranian dog patterns. Examples are: chocolate and tan, chocolate and white parti-color and chocolate merle. 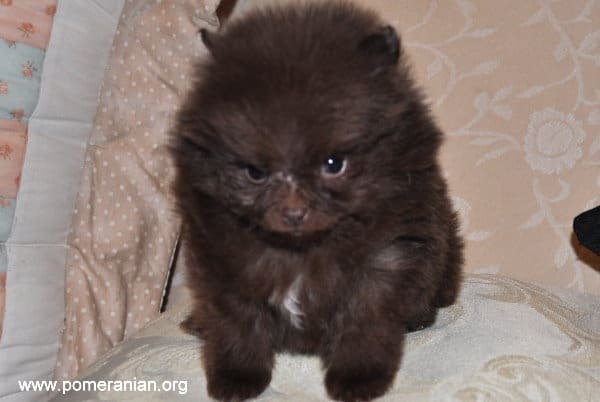 Becoming a chocolate Pomeranian breeder can be difficult. Pomeranian mothers typically whelp small litters. Placing breeders of all the colors at a massive disadvantage. A task further complicated by the fact that browns are dilutes. Additionally this color is the result of a recessive gene. To breed chocolate dogs both the sire and dam must be either a brown carrier, or are themselves a chocolate dog. A chocolate carrier may have one brown parent. Or as we know this gene is recessive, the brown gene may have been carried hidden for many generations. Breeding this color is a tricky challenge. The reality of chocolate being recessive along with a constrained gene pool tends to make breeding these dogs a difficult task. 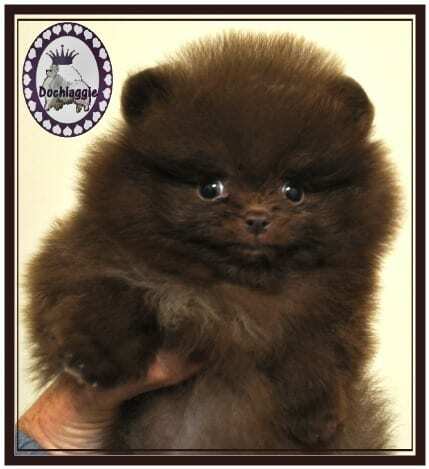 Many past chocolate Pomeranian breeders have experimented combining the standard colors. Such as using blacks or oranges in an attempt to speedily enhance the quality of the brown dogs. Top quality blacks are the recommended outcross color. The result will be a chocolate factored litter. The term chocolate carrier signifies one of the canines parents is a chocolate. Alternatively the actual brown gene may possibly have been handed on. The gene can easily be hidden for many generations when breeding to other colors. In order to continue a brown breeding program, the very best of the litter should be retained. At maturity, this particular canine could then be bred to a chocolate or a chocolate factored dog. 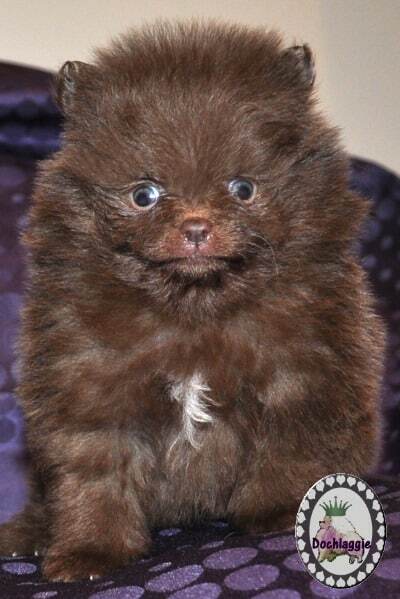 The very first litter of chocolate Pomeranian puppies bred here at Dochlaggie was a complete shock. I was planning to produce whites with this litter. Using a white dog as the sire. The dam was a black girl, who had one white parent. My proven formula to create high quality whites with jet black pigmentation. Delivered in the early morning hours. I experienced an urgent need to examine the litter with much better lighting and cleaner spectacles. 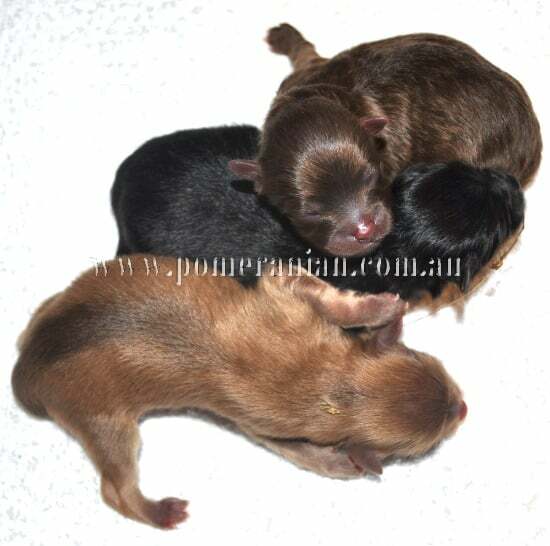 Resulting in a litter, which consisted of a chocolate Pomeranian puppy, a chocolate sable puppy and a black puppy. Being a long-time admirer of the amazing exotic dogs, I was over-joyed with this litter. I then spent many hours on my computer doing extensive pedigree research. All these years, my Poms carried the necessary genes to produce this most wonderful color. Hidden for many generations, until I mated this pair together was the recessive brown gene. I repeated this mating, in expectation of breeding more chocolates. The repeat breeding of this breeding pair was a huge disappointment. The second litter contained the originally planned white and a chocolate sable. Since the very first brown Pom bred here at Dochlaggie, my focus has not been on producing browns. 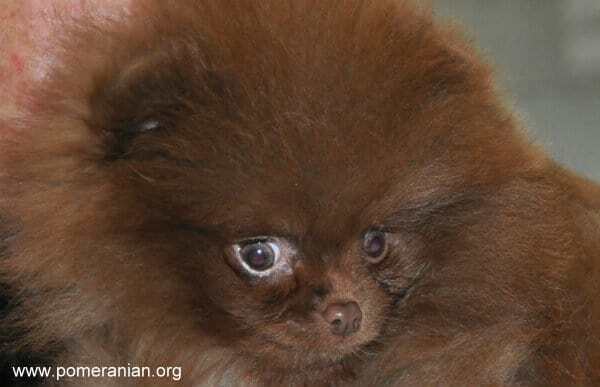 Despite not breeding for browns, other chocolate Pomeranian puppies and beavers have appeared in litters. 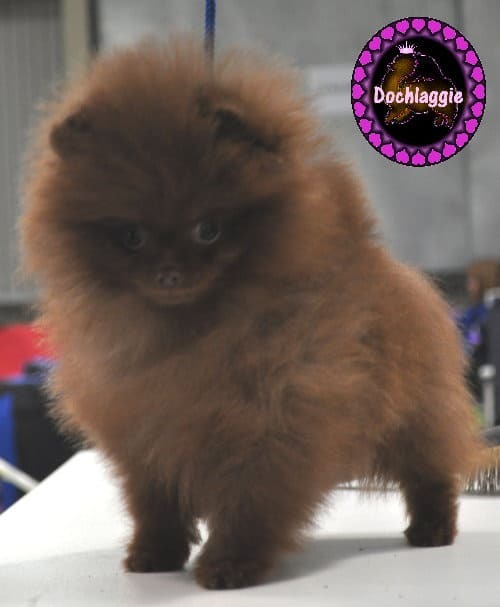 I sold a Dochlaggie breeding girl to another Australian Pomeranian breeder. This girl has produced many chocolate Pomeranian dogs and chocolate parti-color Poms for her new owner. Test breeding’s were utilized years ago, in an attempt to identify the genes of a breeding canine. Because litters are commonly small, the resulting test litter may not produce a chocolate. Owing to actual small litter sizes, repeat test matings would be indicated. Color breeding could possibly be a lengthy process. Modern day scientific advances have made this a much easier task for dog breeders. Talk to your Vet about DNA testing for colors. DNA testing is easy and inexpensive today. Providing a DNA sample is a painless procedure. A swab is obtained from inside the dog’s mouth. Color DNA screening definely makes the breeding of all Pomeranian Dog colors less of a challenge. Proper grooming needs are similar to the other colored Poms. Coat textures on these dogs should mirror that of the black dog. Similar grooming practises to those required by a Black Pom are advised. Click here to refer to our Pomeranian Grooming Section for complete information. Keeping the dog out of direct sunshine at all times. 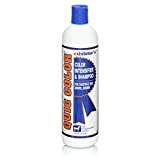 Using color enhancing shampoos recommended for brown Pomeranian dogs. Refer to the Pomeranian Colors page for complete information on all the Pom dog colors. 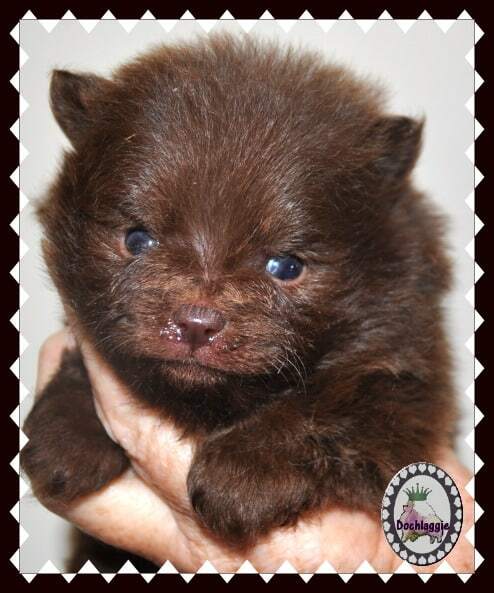 Brown Pomeranian Puppy bred by the Author. 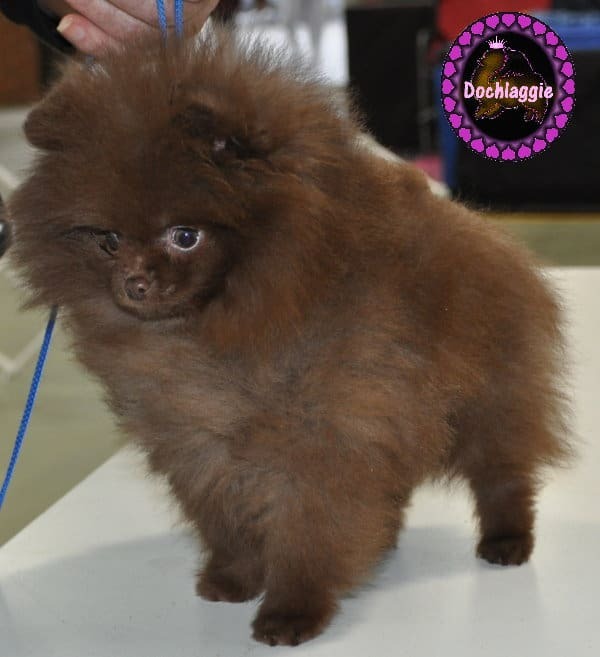 Chocolate Pomeranian Puppy bred at Dochlaggie Pomeranians. Pictured Above: Chocolate Adult Pomeranian exhibited at a Championship dog show. Purchase the Pomeranian Handbook by Denise Leo.